My but the first of May 2011 was busy! The sun came out to play in the Willamette Valley and the rain stayed away. 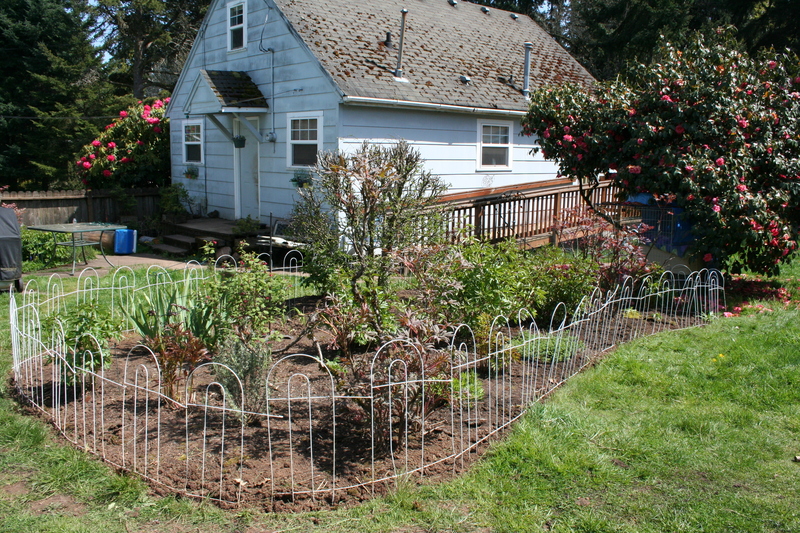 I got that flower bed weeded. Harvey helped. My uncle in Texas called and talked to me for the better part of an hour, filling me in with vital family history and vignettes of family lore. It was wonderful and I kept a little note tab by the phone where I jotted dates & names. Less than half an hour later, my dad called. He didn’t know I’d just been on the phone with his younger brother. Dad had more stories and names and dates for me. We also exchanged a little “bird talk” because I was watching my bird feeder and telling him what birds were visiting. 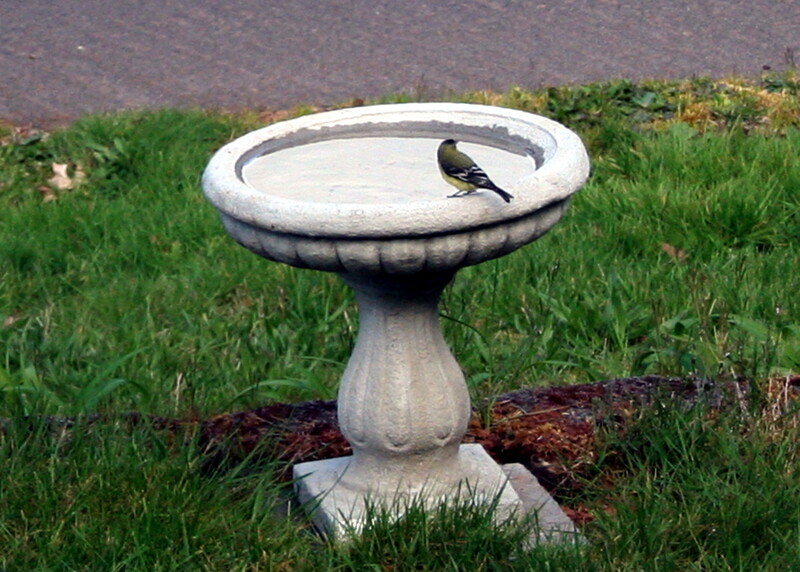 The olive-backed Lesser Goldfinch that I was watching while I talked to my dad. I told him about the osprey that was flying over my house as I weeded. I seriously need a good telephoto lens. 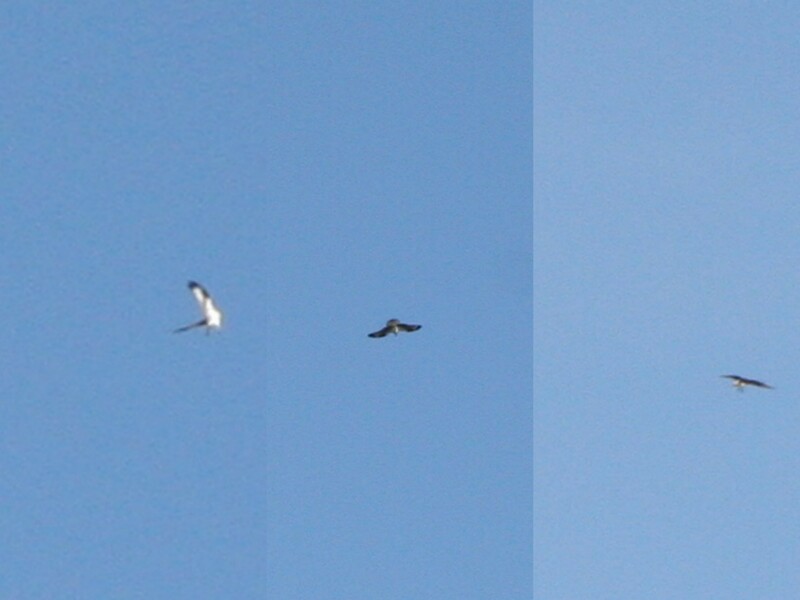 At least one osprey does this every year: “scree-scree-scree-scree-scree” it calls as it circles, dips and dives over the cliffs just a half mile from my house. It hangs suspended over the Willamette River, trying to impress some phantom female. My dad told me he did not know I had osprey up here. They had osprey in St. Anthony, Idaho where he grew up. There’s a huge nest on “the steel bridge”. He added that he hoped vandals could not get to the nest. I hope so, too. It would be a Federal crime to destroy an osprey nest (or any protected bird). I love the ospreys we have that fly over in the spring, calling to their mate. Of course, that wasn’t all of May 1, 2011, but I leave the rest in the hands of historians as to whether or not the date is significant enough to record. For me – the family stuff is enough. Hmmmm, serious case of dejavue……sending you photo of osprey nest on St. A bridge, too. I’m regretting not calling Gramps reading this… I had his number on my list to call over the weekend (if you can call working 6-7 hours a day rather than 10-11 a weekend), and I never did. This is so funny/odd. Everyone I have called about him today said the same thing, “SHOOT! I was going to call him this week!” I hope no one is feeling bad about missing the moment. It happens. Cousin Reissa was going to tell him about the property for sale in Idaho, cousin Eloise was going to let him know she was planning a road trip down to see him with her sister (Sylvia, named after Dad’s real mom), Uncle Mike was going to call him after he talked to me on Sunday… No regrets, young man. You’re not alone in the regrets dept.